Sadly, this album is yet another example of some ex-girlfriend asking, "Exactly how many copies of that record do you really need?" That said, well, as everyone knows, it was Helen of Troy, whose face launched a thousand ships. And it was this album that launched a thousand (and perhaps many more) nerdy guys toward the nearest dictionary in our own noble quest to find the meaning of the word, undinal. You know, I loved other less proggy bands in the 70's like Mott the Hoople, Big Star, Free, Stray, and (my beloved) Budgie, but not once did those bands ever use the word undinal, or any other adjective that referenced (according to Mr. Webster) "a female water spirit who could earn a soul by marrying a mortal and bearing his child." Even Peter Sinfield, Crimson's word guy, never ventured so deeply into mythology. Not only that, but the song "Cinema Show" has a wonderfully catchy chorus that name-checks none other than Tiresias, that blind Greek soothsayer who hung outside of Thebes, and had the dubious distinction of being transformed into a woman for seven years, only to be asked the equally dubious question as to which gender enjoyed life, and all of its many bounties, more? Well, he didn't exactly ingratiate himself to the big guy Zeus. And, trust me, that's not a smart thing to do. Not only that (again), but that Father Tiresias reference caught my ear when some literature professor mentioned that he was the very same Greek geezer who does something or other in T.S. Eliot's The Wasteland. And that's why I became a big reader. Of course, there were other bands, but that word, undinal, a Tony Banks and Mike Rutherford casual mention of Tiresias in the chorus of a progged up pop song, and, of course, the rest of this glorious fifty-two or so minutes of music, certainly opened a few doors of perception. 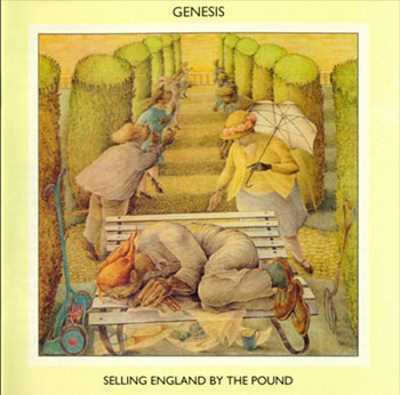 By the way, this was the very first Genesis record I bought. And as I waited for the city bus, I examined the record and was really amazed by its length of playing time, especially with the number of really long songs. Many records of this era ended with a coup de grace of, say, Heep's "July Morning," Savoy Brown's "Hellbound Train," or the double-barrel shot gun blast of Wishbone Ash's "Warrior/Throw Down the Sword." But this one had epics all over the place. And that's the way of the Genesis world before Phil, Mike, and even Tony, decided to become "Illegal Aliens" and not have any "Fun" (Oh my goodness!). But way back then, as a five-piece, they had epics all over the place. So, epic number one, "Dancing Out with the Moonlit Knight": This is a very arranged song that harkens back to the previous album Foxtrot (which included the greatest prog song ever, "Supper's Ready"). Steve Hackett's guitar figure is lovely, and it will resurface in the final moments of the record. (But that's something only Tiresias could predict). And, Peter Gabriel's lyrics are clever and ironic beyond anyone's belief in cleverness and irony. Sure, we all chew through our Wimpy dreams. And the song has a twelve-stringed coda that is a Time Table back to the innocent Charterhouse School Anthony Phillips days. And, oh, Gabriel's voice is a gift from the gods. Epic number two is the monumental "Firth of Fifth," with its generous proportions of all things prog. There's the (almost classical) piano intro, the song proper, which is filled with self-importance and drama (Yes! This is mainly a Tony Banks composition! ), lyrical images of "gods and men," "Neptune," "The Shepard," and well, the whole shebang of progressive rock. But all of this is simply a prelude to the lengthy instrumental section that fuses Gabriel's haunting flute, Tony Banks's big orchestrated keyboard canvas of color; and, most importantly, Steve Hackett's signature guitar solo that, quite simply, bleeds with sonic passion. This is the music of benevolent Sirens. I think this is the most beautiful moment in the progressive rock movement. And that's saying quite a bit. Now, tucked betwixt these two songs is the quirky almost hit single, "I Know What I Like (In Your Wardrobe). And this sort of tune is the necessary relief, the jester's joke, the weird melodic sideshow, and, ultimately, Genesis the band being surreal, hopelessly silly, and, at the same time, impossibly creative. It's all like a bit from (the already mentioned) T.S. Eliot's The Wasteland, whose title speaks of the severe pathos in our modern world; yet amid the bleak topographical lines of the poem, suddenly, some guy thinks about a popular song and we read (and sing) the lines: "O O O O that Shakespearian Rag/It's so elegant/It's so intelligent." Yeah, the almost-hit single was a wonderful paradigm shift, that follows in the footsteps of "Willow Farm." And that's the absolute salvation of the song. Amid the dense structured drama of deep prog rock, there lies the silent sun of a pop tune, a timely music hall rag, albeit with a guy on stage trying to be a lawnmower or a flower, but that's beside the point. For Phil Collins fans, I suppose, it's important to note that he sings the acoustic side-ending "More Fool Me." But it's also important to note, as stated in Robin Platts's book Genesis Behind the Lines, that Daryl Stuermer (Steve Hackett's replacement) said, "I find it hard to believe they (Gabriel and Genesis) were ever in the same band." So, for all Phil fans, as Joseph Conrad said, "Approach with caution." For all others, simply enjoy the complex "Battle of Epping Forest." This is a multi-voiced character drama, an early Genesis trademark that started with "Harold the Barrel" and then morphed into the concert favorite "Get'em Out by Friday." It's an absolutely wonderful thirty-minute song that is urgently compressed into the confines of eleven minutes. But, in all critical fairness, Tony Banks may be right when he said (again in Robin Platt's book), "Everyone had a part and everyone's part on its own was good enough to be the top line of the song and none of us would give an inch." Ah, but I love the acoustic break recounting the sad saga of "Louise and her Beautiful Chest." To avoid the song's compression of an auditory case of the bends, what follows is neither "you" or "me," but rather the very necessary sort of classical guitar bit (with Tony Banks' keyboard help) by Steve Hackett called "After the Ordeal." But this simply bridged the necessary breath of oxygen into "The Cinema Show," which is perhaps the show stopper, and perhaps the acoustic-based keyboard enhanced tapestry that Genesis had always promised to produce. It's great because it is an extremely satisfying piece of intelligent rock music in a time when intelligent rock music, for some odd reason, seemed to matter. Yes, this tune quotes that soothsayer Father Tiresias, but with this mainly Banks/Rutherford/Collins tour-de-force, when viewed through the shared eyeball of The Fates (yet another famous trio), the musical future of Genesis, even after the future loss of both Peter Gabriel and Steve Hackett, will echo the words to the before-mentioned Phil sung "More Fool Me," that says, "I'm sure that it will work out alright." It all dissolves into Steve Hackett's lovely opening guitar melody and a litany of grocery prices sung by the "Don't Give Up" world-weary voice of Peter Gabriel, he of future international anthem "Biko" fame. Selling England by the Pound, indeed. It pleased the crowds for years to come, even with Phil singing the song. Back in the not-so-old days, when I still bought hard copy glossy magazines, one progressive rock special edition rated Selling England as the #1 greatest prog album of all time. And then a different mag, not to be out done by the cash register's claim on those of us who still bought actual printed musical news, announced Yes's Close to the Edge to be the topper most of the prog popper most. But my vote will always be cast for this Genesis record. I mean, imagine my shock and horror, when, thinking my vocabulary had grown a notch with the really cool word khatru, found, sadly that there was no such entry in my well-worn Webster, well, because there was no such word, Siberian or otherwise. And, that said, I'll just agree with Lewis Carroll who once wrote, "'Twas brillig, ... And the mome raths were (certainly) outgrabe." So, after all these years, after all the purchased copies, after countless spins while reading equally countless books, and after, quite frankly, never once being able to successfully use the word undinul in useful conversation, let's just say (again!) this is an album of British wit, sublime melodies, and, etched into all these grooves, a great dose of progressive rock oddball everything.